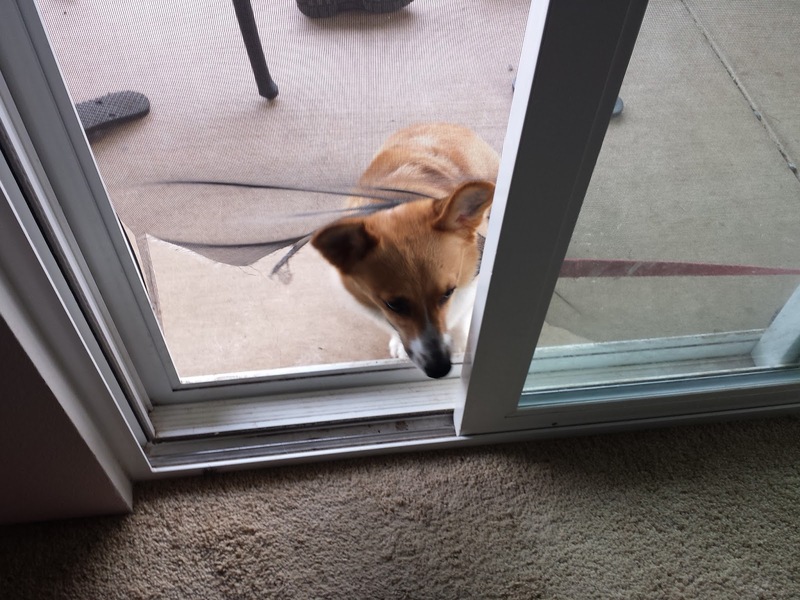 If you've been following my blog you may recall that I have two corgis. 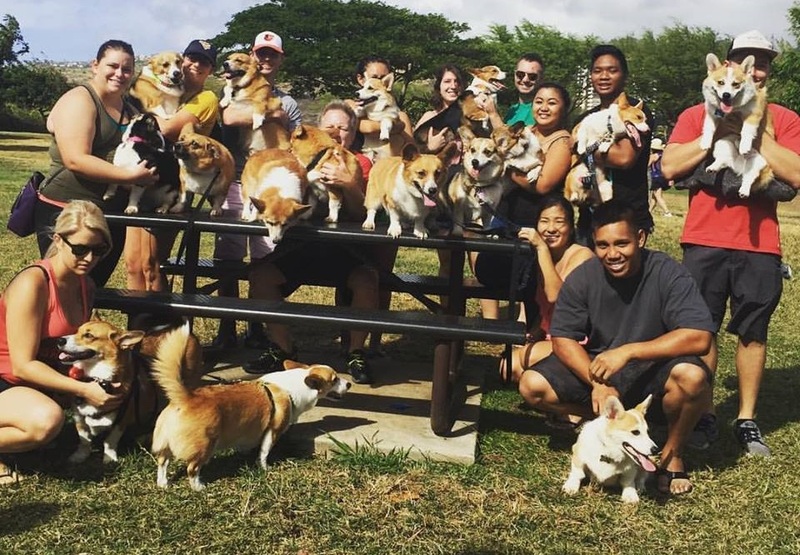 Every month our fellow corgi pawrents hold a meet up at the dog park. This is when my dogs can see their old friends and litter mates and pretend that frapping is the most important thing in the whole wide world (because isn't it?). These dogs may be full grown now, but most of the corgis you see here were adopted as puppies. That means every one of these pawrents has their own puppy stories to tell. 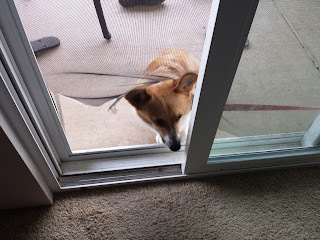 I'd like to share a few of my experiences with you and what I wish I had known beforehand about puppy proofing to keep both my puppy and my home or belongings safe. Hopefully it can save you some time, money, and your sanity. 1. Pee pads don't always protect your floor. A new puppy usually means potty training. House breaking can be a tricky son of a gun. You read up on potty pads and regular pee schedules and finally feel like you're ready to leave Fido at home by himself for a day with his pee pad. After a long day at work you come home to find the pee pad in ten trillion pieces scattered all around, including--is that a piece in his mouth?! And of course, there's a puddle of pee on your hardwood floor. And a turd. They next day (or entire week) you get smart and tape that sucker down to the floor only to come home to the same results. Ohmygosh the turd is STUCK to the ground now because of the tape residue. It was time to accept the fact that my dog is a living, breathing paper shredder and my hardwood floor is doomed. It's not just a cat thing. 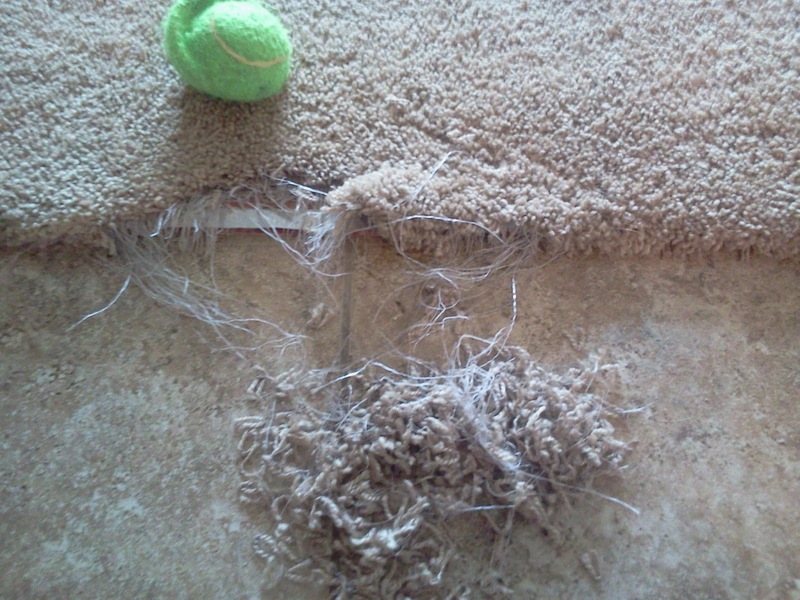 But dogs don't scratch carpet so much as CHEW ON IT. 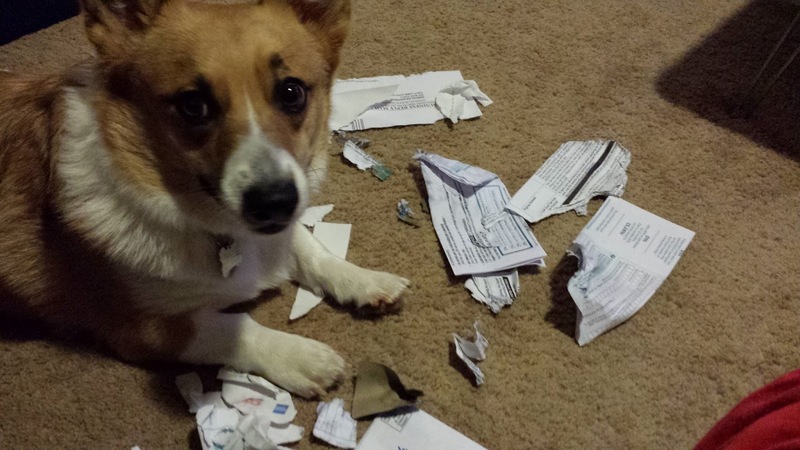 In fact, dogs like to chew on lots of things. Mine go for anything soft, including but not limited to sofas, pillows, mattresses, PEE PADS, and my childhood stuffed bunny that is currently resting in pieces. I keep my dogs in an exercise pen when I'm away during the day because I'd like my couch to live to see next Christmas. The pen is in my kitchen which is connected to my living room, but due to space constraints the pen sits at the edge of my kitchen. Right. Next. To. The. Carpet. Guess what I came home to one day? 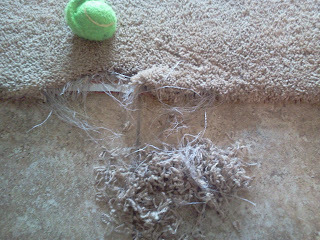 My poor carpet. In my less-than-one-year-old house! Since then that four-inch disaster has expanded to the entire length of carpet (ie, about ten feet), but to keep from going insane I tell myself that I have a five-year plan to replace the carpet with laminate, anyway. Hmph. When dogs get bored they make their own fun a.k.a. mischief. So if your dog is going to be by himself all day be sure he has plenty to keep him occupied. If you have an energetic dog who likes a challenge, plain old treats and chew toys will be history in under five minutes. You'll need mentally stimulating toys to keep his mind busy. I find that treat dispensers set at the hardest level work well. That should keep him from shredding your upholstery for a couple of hours. Then when he's done with it he'll be so mentally exhausted that he'll sleep the rest of the day. Just keep in mind that if he's going to be by himself try to avoid using treat dispensers with hard plastic on it because speaking from experience, when Rover gets frustrated he'll resort to dropping and breaking it to get those treats out. The last thing you need is for him to eat those tiny plastic shards too. 3. Keep expensive items out of reach. It sounds like a no-brainer, but you'd be surprised what puppies can sneak into. 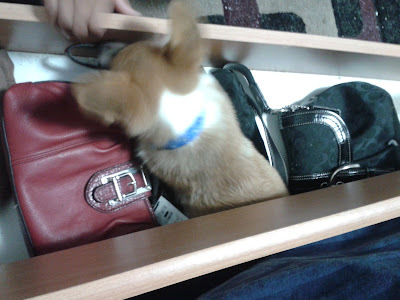 I thought my purses would be safe inside a closed drawer at ankle level. Silly me. If you're lucky, you'll find him before any damage is done. Otherwise, be prepared to shell out $300 for a new bag. In my case, my puppy didn't chew up my bag. Nope. Instead, he thought it'd be fun to hide in my bag drawer when he had the runs (I left out the 'after' photo so you don't lose your lunch). Shoes, wallets, purses, that brooch that's been in your family for generations - if it's worth more than a dinner for two at the Ritz-Carlton, make sure your puppy can't get to it. This means keeping it high up on a shelf away from things he can jump on to get to it. Table tops don't count - dogs are experts at figuring out how to get at food left out there. That also goes for bills and credit card statements. Everyone knows not to keep poisons out around animals. This includes weed killer, fertiilizer, and pesticides. I take care not to leave anything out on the lawn where my dogs run around, but I did leave a Ziploc bag of snail pellets on my raised planter once while I ran in the house to grab a drink. What I came out to made me want to cry. The baggie was ripped apart and the pellets were spilling out all over the grass next to my smiling 7 month old puppy who thought she had discovered a bag of hidden kibble. I was certain she was going to get sick and maybe die of poisoning. Fortunately, I think I caught her before she ate any and no sickness ever occurred, but it really got me thinking: if a 10 pound puppy - a short stumpy corgi - can reach something at least six inches higher than her while standing on two legs, then how high do I have to keep the hazardous stuff? When a dog wants something up high, she'll streeeetch as far as she can to get it. That's when their inner genius kicks in. Never underestimate a dog's brain; it's outsmarted my human one on numerous occasions, and I'd like to think I'm not a total dunce. So keep those hazardous chemicals stored at least a foot higher than your dog at her tallest (that includes outstretched front paws! ), again with nothing nearby that she could jump on to get to it - especially if it's something granular that could be mistaken for treats. And if you're blessed with a dog with mad hops, you'd better store that fertilizer even higher. Better yet, lock it away in a container. Also remember that just because it says 'pet safe' doesn't mean it's not dangerous for them. 5. 'Sit-stay' is probably the best command you can teach your dog. My dogs love going outside. Everyday when I come home from work they play in the backyard for about an hour. Sometimes they get so excited that they make it to the back door before I do. Normally this isn't a big deal because they'll just sit there until I open it. I guess one day Macho couldn't contain his excitement because he charged right through that screen door like a football team on game day. If your dog gets as excited as mine to go outside, try to drill the 'sit stay' command into his head from early on. My younger dog is great at it, I have no idea why her older brother can't be a good role model. You'll definitely save yourself a ripped screen door and maybe even prevent him from bolting out the front door and getting lost in the neighborhood. In fact 'sit-stay' is actually a great command in general. Use it for crossing streets, keeping your pup from eating mystery nuggets on the sidewalk, or when other dogs pass by. I've learned so much about dogs since becoming a dog owner, and I'm sure there's still more to come. Doing your research ahead of time and talking to people helps a great deal in knowing what to expect, but every dog is different and will come with her own tendencies that you'll have to adapt to and deal with in terms of puppy proofing your home. The most important thing to keep in mind is that a dog is a family member and should be treated as such. They need love and affection just like humans do, as well as a healthy dose of playtime. At the same time they also need to be trained and disciplined as necessary to keep them safe from danger. Keep this in mind and coming up with puppy proofing ideas will be a piece of cake. 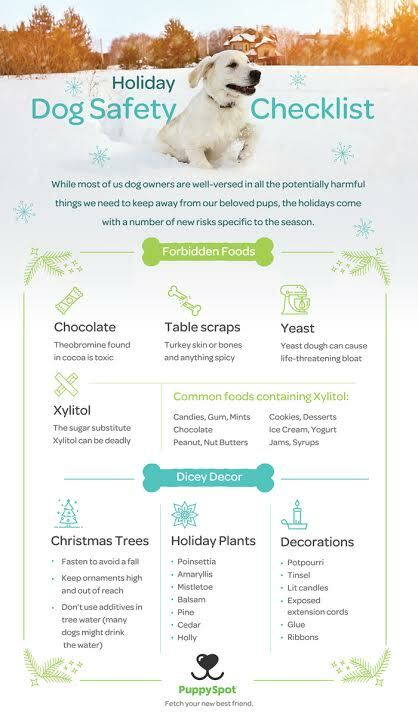 With the holidays quickly approaching, PuppySpot (a service that helps place puppies with their furever homes) and I wanted to share a few tips for keeping your pet safe during the festivities. Keep them away from the hazards listed below so both of you can enjoy a wonderful and safe holiday season. 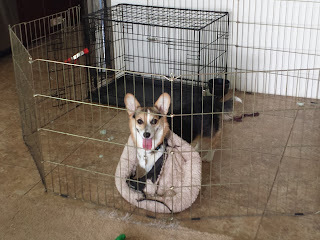 Note: This post was inspired by a request from PuppySpot for ways to puppy proof a home. I'm reading this but I don't have any dog lol﻿. So would like to take a puppy asap from Dog Peer and apply your trikes asap.